CLC President Hassan Yussuff speaks during a news conference about pay equity in Ottawa on Oct. 31, 2018. The leaders of Canada’s largest labour organization and a prominent national Muslim group say Conservative Leader Andrew Scheer is emboldening far-right extremists by failing to call out Islamophobia following the New Zealand mosque shootings and attending events with people who promote hate speech. 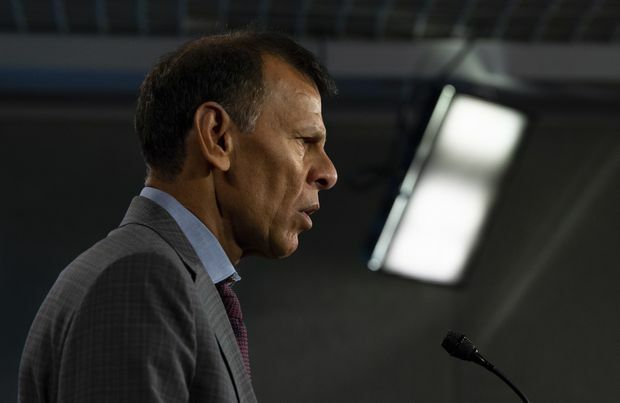 Canadian Labour Congress (CLC) president Hassan Yussuff criticized Mr. Scheer’s response to the shootings at two mosques in Christchurch last week that left 50 people dead and dozens more injured. Mr. Scheer issued a lengthy statement about the terrorism attacks Friday after his initial Twitter message on the shootings were criticized for failing to mention that the victims were Muslims. “Unfortunately the opposition leader had to be shamed to do a 180-degree turn to actually acknowledge what happened. Had he not been shamed, I’m not sure he would have changed his position,” Mr. Yussuf said Thursday. “There is a real danger that this kind of association helps to embolden others to feel like they now have licence to act out on their hatred and on their ideologies,” Mr. Gardee said. Mr. Yussuf also condemned Mr. Scheer for sharing a stage with “racists and bigots” at a protest led by a convoy of pro-pipeline, anti-carbon-tax demonstrators in February. Former Rebel Media personality Faith Goldy also attended the rally on Parliament Hill, where she told Indigenous counterprotesters to leave Canada if they didn’t like it. Mr. Yussuf said Mr. Scheer should know better than to attend events with right-wing figures such as Ms. Goldy. Opinion: Can Andrew Scheer bring two sides of the Conservative voter base together? A spokesman for Mr. Scheer said the Tory leader was “very clear and emphatic” in his condemnation of the anti-Muslim hatred that motivated the New Zealand mosque attacks. “Further, in his speech to the House of Commons earlier this week, he called for action to defend a concept of Canada rooted in shared civic values, respect for the principle of universal human dignity and freedom of religion for all,” said Brock Harrison, Mr. Scheer’s spokesman. The CLC and the NCCM shared their concerns at a media conference about the rise of Islamophobia in Canadian workplaces, where they released a new report on the matter. The report cites a steady rise in hate crimes targeting Muslim communities in Canada over the past several years, fuelled by far-right politics at home and abroad. It makes several recommendations aimed at reinforcing the responsibility of employers to educate management and staff about legal obligations around human rights and religious accommodations for Muslims. It also calls on governments to do more to support anti-racism awareness campaigns and develop strategies to combat online hate speech. “What we’re talking about here is the everyday micro-aggressions that inform this fearful environment that many Canadian Muslims exist in and infiltrates every aspect of their daily life,” said Leila Nasr, NCCM communications co-ordinator.